Yesterday, Warner Bros. Studio Tour Hollywood held a press event to unveil it’s latest exhibit: From J.K. Rowling’s Wizarding World: The Harry Potter and Fantastic Beasts Exhibit. Dan Fogler and Bonnie Wright were on hand for the special event. Warner Bros. Studio Tour Hollywood is open Monday through Sunday, 9:00AM to 3:00PM, with studio tours departing every 30 minutes and extended hours offered during the summer season. Reservations are recommended and all children eight years or older are welcomed. Tickets are $62 per person and can be purchased online at www.wbstudiotour.com or by calling 818-977-TOUR (8687). Photos from the afternoon can be found in our gallery and watch a video including interviews with Dan and Bonnie as well as footage of the exhibit below. Our review will be coming in the next few days. Warner Bros. 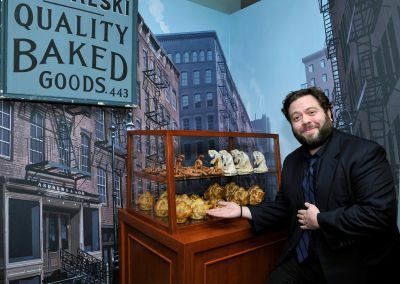 Studio Tour Hollywood revealed its latest tour addition, From J.K. Rowling’s Wizarding World: The Harry Potter and Fantastic Beasts Exhibit, with special guests Dan Fogler (Fantastic Beasts and Where to Find Them) and Bonnie Wright (Harry Potter film series). Opening to the public on December 9, 2016, the reimagined exhibit offers an up-close look at authentic props and costumes from Fantastic Beasts and Where to Find Them and the beloved Harry Potter films. Tour guests will now be able to explore how J.K. Rowling’s Wizarding World has been brought to life on the silver screen over the past 15 years. The expansion will take guests on a journey from concept art to final designs used on set. Tour guests will be able to see the detailed costumes of Lord Voldemort, from a young Tom Riddle to his rise as the Dark Lord. Guests will also have the opportunity to be sorted by the magical Sorting Hat into one of the four Hogwarts houses. This interactive experience will take place in front of a life like image of the Great Hall which will include costumes of iconic Hogwarts professors. As a finale to the exhibit, guests will be able to explore the newest film from the Wizarding World, Fantastic Beasts and Where to Find Them. Highlights of the Fantastic Beasts experience include costumes worn by Eddie Redmayne (Newt Scamander), Katherine Waterston (Tina Goldstein), Alison Sudol (Queenie Goldstein), Dan Fogler (Jacob Kowalski) and Colin Farrell (Percival Graves), as well as Newt’s case of creatures.